Hey ladies and gentlemen and welcome to the ultimate NASM test prep hub. 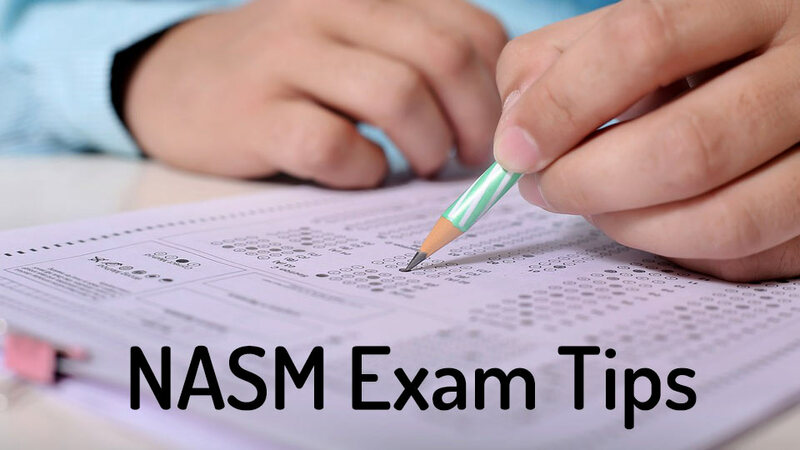 Here you will learn the most important NASM study tips and NASM exam tips so that you can figure out how to pass the NASM exam without stressing out. 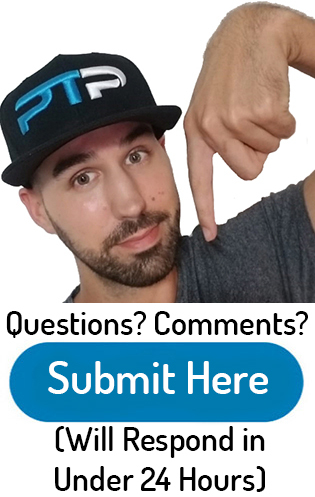 I will be going over the most difficult NASM test questions that you will encounter on the exam as well as the NASM CPT exam answers for those tough questions. 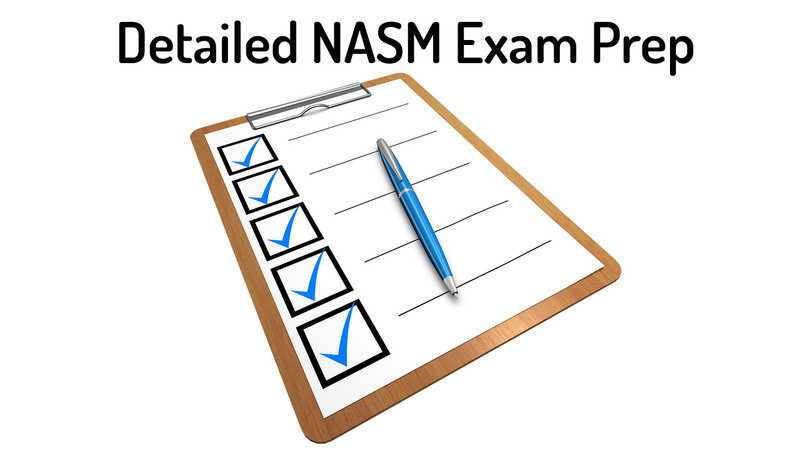 For additional NASM CPT test questions and answers besides the ones located on this page, check out my free NASM practice tests and quizes here. Leave me a comment at the bottom with any questions. For this section, I will be going over the most difficult NASM test questions. The goal is to try to answer these questions by yourself before moving on to the NASM CPT exam answers in the next section. Try your hardest to think out the question first. If you can’t figure it out, refer to the book. If you want more NASM test questions, you can also access my free NASM practice exam and study guide right here. Which of these options is released in the synaptic terminal in order to stimulate muscle contraction? When the calves experience tightness, causing the feet to turn out, which of the following has happened? While the foot is in a plant position touching the floor, what muscle is able to internally rotate the hip? Within the lower extremity proprioceptive progression continuum, what exercise comes after the half foam roll? Which for supplements have the highest potential in adults to produce excess dosage? Try your best to answer these questions before moving onto the NASM test answers. NASM question number 1 breakdown: Immediately taking a look at this question you should know that it is a science related question that comes from chapter 2. They are specifically referring to figure 2.38 in chapter 2 where they list the 10 steps for starting a muscular contraction. Out of the 10 steps, the four mentioned in the question are all located in the 10 step process, making this question one of the hardest NASM questions on the test. On top of this, in the textbook, the correct answer is abbreviated which makes most people second guess the choice that they pick. The most important part to pay attention to is the fact that they say “synaptic terminal” is this is the only hint that reveals the answer. NASM question number 2 breakdown: One of the things that frustrate me as well as a lot of my students that are studying for the NASM exam is that they don’t tell you what these topics are in the textbook. What they do discuss are the force couple relationships as well as the length-tension relationships. What they do not do is give the definition of what the altered states actually is. I guess some could argue that it is common sense, but I would say that there is a lot of argument for misinformation. For example, we know that feet turning out is a muscular imbalance. What they failed to mention in the book is that poor posture and misaligned joints are what is caused by altered length-tension relationships. Instead of just memorizing the definitions in the textbook, NASM is trying to have you answer the question based on the principles and concepts that they talk about. Overall, a very difficult question for most that add one missed answer on their test. NASM question number 3 breakdown: Overall, this is a difficult question because to answer, one would need to completely memorize the concentric actions for the majority of the muscles located in Appendix D.
But before you freak out, I would not worry because they don’t ask you that many questions about muscle action. I definitely would not spend an extra 10 to 20 hours studying these just for a few questions. That being said, being aware of the larger muscles will definitely help you on the test. In the appendix, the TFL is a muscle that performs internal rotation. The tricky part is when you add in that the foot is planted and touching the floor, and most people feel like it is not the right answer. It is still the correct answer though. The other answers on the list perform external rotation of the hip or do not perform rotation at all. Big tip: Remember that the TFL is associated with multiple different muscular imbalances. I assure you that this question is not the only question that it comes up in. NASM question number 4 breakdown: This question is difficult because it is one where you need to memorize something very specific from the book. Although a lot of us have basic training intuition, sometimes it is not enough. This answer can specifically be found in table 10.1 from the balance chapter. At the bottom, you will notice that it mentions “These modalities come in many sizes and shapes that will dictate proper progression. Many people have difficulty choosing between the foam pad and the balance disc in terms of proper progression. This is a case where straight up memorizing a table is sometimes better than depending on the concept or logic of a particular topic. NASM question number 5 breakdown: I’m guessing that you glanced over the section as you are studying the dietary supplement chapter. Most people can recall a few of the vitamins that can be toxic if consumed in excess, but most people can’t remember all four of them. Honestly, the majority of people missed this question on the exam. The answer can be located approximately two paragraphs after table 18.3. This question is difficult because every single supplement has the potential to be abused and taken in excess amounts. NASM wants you to remember for specific ones for our society and for most people that consume an American diet. In table 18.3, two minerals and three vitamins are specifically mentioned. They are zinc, iron, B6, vitamin A, and vitamin D.
Well, now that you know those NASM exam answers, you’ll be able to ace those five when they come up on the final exam! Let’s move on to some other NASM study tips so that you can be prepared to tackle the 115 remaining ones. While studying for the NASM, here are the best study tips so that you can focus on the right material while going through the textbook. Here I’ll be talking about the most essential NASM study materials that you need in order to dominate the exam. Here, I will be going over all of the NASM study materials that myself, as well as my students, have found to be the most effective way of studying the NASM CPT test. The Holy Grail of beginning to study for the NASM exam is the essentials of personal training sixth edition textbook. Every single question that comes from the test can be located within their primary textbook. The sixth edition consists of 20 total chapters as well as the appendices A-E. Every single chapter, including the additional appendices, should be read over at least once. Big tip 1: a lot of people don’t feel that they need to go over the appendix section. But to be honest, there are lots of questions that come from this section. The majority of them coming from appendix E! Big tip 2: There is decent information in the code of professional conduct section (the preface of the book). You do not need to memorize the section, but you should have a general understanding of what each code means as well as how to apply it to the world of personal training. 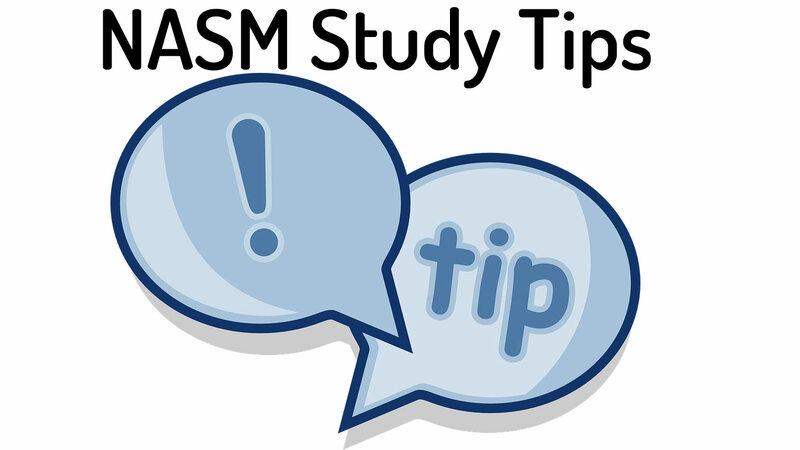 Big tip 3: Some of the NASM chapters are more important than others when it comes to passing the NASM test. I still recommend reading over the full textbook as this is very important to becoming a great personal trainer. That being said, the majority of the NASM exam questions will come from the following chapters. I recommend reading the specific chapters at least twice. Big tip 4: When it comes to studying the sections of the appendices, understanding the muscles of the muscular system is the most important topic. Primarily focus your studies on the major joints and larger muscles. Have a good grasp of the joint motions for concentrated and eccentric muscle actions/integrated function. Also, realize that the stabilizer muscles of the shoulder, as well as the core, will show up on the test and also be very useful for real-world applications of the knowledge. For most individuals, reading through a grueling textbook is one of the hardest things to do. Especially one that is as long as the NASM textbook (700+ pages). For this reason, a good study guide is recommended. Here at PTPioneer, we have an absolutely free NASM study guide that goes over all 20 chapters of the sixth edition textbook. This is definitely the place you should start. In addition to this, we also have a premium NASM study guide for those of you who want more concentrated study. From working with over a thousand students, we have seen that or premium study guide cut their overall study time approximately in half. It tells you exactly what to focus on in order to pass the exam in which sections you will not generally be tested on. You will also be able to download the NASM study guide PDF for easy studying anywhere. 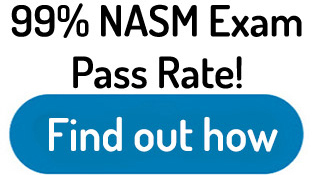 Taking practice exams is third most recommended NASM study material on the list. Being able to recognize how NASM will word their tricky questions is what makes practice tests so valuable. Practice tests also help you understand which sections you understand well, and which sections you need to focus more study time on. If you cannot pass the practice exams, you can be well assured that you will not pass the real exam. Here at PTPioneer, we have a free NASM practice test that you can take. 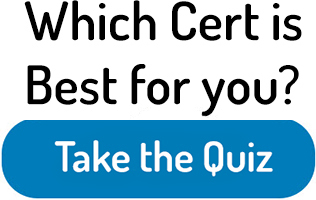 This practice exam consists of 60 questions, and are laid out in the exact same manner (The correct number of questions coming from the correct sections ) that you will see on the real exam. On top of the practice test, we also have practice quizzes at the end of each chapter in our free study guide. 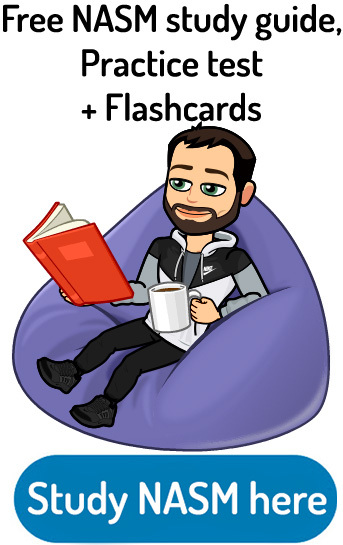 The fourth essential NASM study material is to use flashcards. There are hundreds of different terms that you need to memorize straight out of the NASM textbook. The absolute best way to study these direct terms is to use flashcards. Not only that, but you should be using some sort of spaced repetition learning system. Spaced repetition is different than using general flashcards. 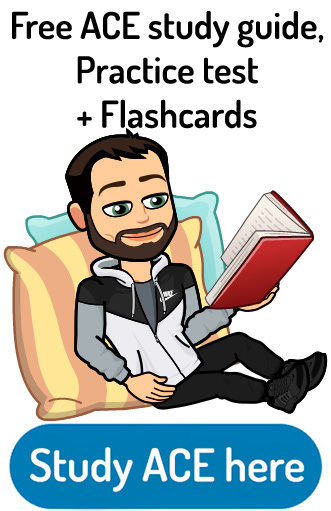 With general flashcards, you will see every single flash card with the same frequency as the rest of the deck. This means that the concepts and terms that you know well will be shown to you just as often as the ones that you have trouble with. With spaced repetition flashcards, a mathematical system will calculate which cards you are good at and which cards you struggle with. It will then add longer intervals when showing you your easy cards in the deck, while at the same time having shorter intervals when showing you the harder more difficult terms in your deck. This significantly reduces overall study time as you were concentrating your study sessions on the more important material. It is also the best way to concrete this information into your long-term memory as intervals studying has shown to significantly increase the retention of information. This type of studying can only be done using an application. Here at PT Pioneer, we have designed a flashcard deck that has over 1100 flashcards for the NASM exam. The application uses spaced repetition learning so that you can memorize all of the terms with ease. One of the biggest NASM study tips that I have for you guys is to focus strongly on the NASM OPT training model. You need to know all of the different levels and different phases for the OPT model. You also need to know how the OPT model applies to different training modalities such as resistance training, balance training, core training, reactive training, flexibility training, cardiorespiratory training and SAQ (speed, agility, and quickness) training. Big tip: You need to know the exercises that apply to the different levels of the OPT training model for every single training modality mentioned above. Big tip: The overhead squat assessment is absolutely huge on the exam. You will see over 10 questions on this assessment alone. Some of my students have reported seeing up to 15 questions on this single assessment. You need to know what to focus on from the anterior view as well as the lateral view. Which muscles are overactive and which ones are underactive? Memorize this whole list! You need to be able to identify other common muscular imbalances such as pronation distortion syndrome, lower crossed syndrome, and upper crossed syndrome. What are the under and overactive muscles for these syndromes? Practice doing fitness assessments with friends and family. Here are some general tips I have for taking the NASM exam. 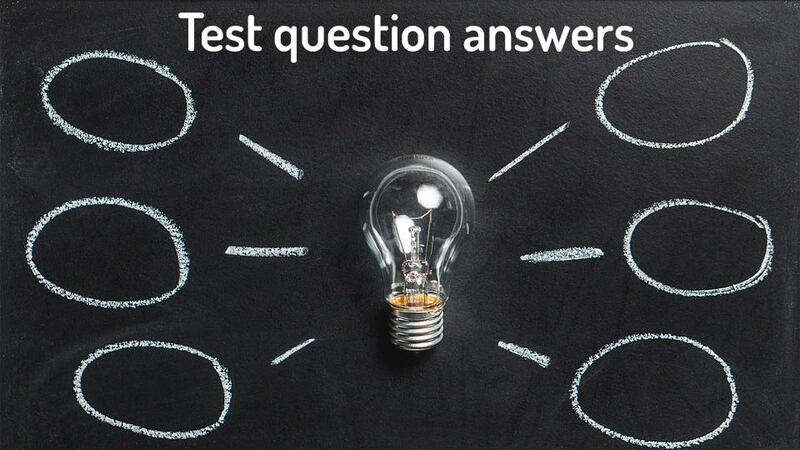 One of the biggest reasons that people miss 3 to 5 questions on the test is because they do not read over the entire question or all of the possible answers before making their decision. This is very important. Read over the full question. Then read over every single possible answer. Think about all of the possibilities, and then make your final decision. The wording on the NASM can be very tricky. In fact, at times it feels like they are purposely trying to mislead you at the beginning of the question. The only way around this is to completely read out the questions. The next NASM CPT exam tip I have for you guys is to pay attention to certain keywords that relate to specific exercise questions and the OPT training model. Big tip 1: Any time that you see the words Bosu ball, stability ball or one leg, the majority of the time that answer will apply to the stability phase of the OPT training model. Big tip 2: Any time that you see jumping exercises or exercises that have to do with using a medicine ball, they typically apply to the reactive/power phase of the OPT training model. Well, ladies and gentlemen, that is about it for my NASM exam prep article. Make sure to pay attention to those five most difficult NASM test questions as well as the NASM CPT exam answers. Use my NASM study tips to guide you through the textbook and I highly suggest following along with a good study guide such as my free one, utilizing practice tests and concreting the information with flashcards. If you want to cut your study time in half, check out my premium NASM study guide here that also comes with an exam pass guarantee. Follow along with the other study tips mentioned and pay attention to the “big tips” that I mentioned throughout this article. So if you were trying to figure out how to pass the NASM CPT exam, I really hope this article helped out. Leave me a comment below to let me know what you think or a story about your NASM experience. Till next time everybody, good luck with your studying!